A subset of the O & O team, the FMTA Admin Assistant undertakes research and communications for the FMTA, researches and maps all demolition applications in the City of Toronto and also provides Tenant Education Workshops to Newcomer groups in the City. The Tenant School Project is funded by the Law Foundation of Ontario to provide in-depth classroom style training to rural community workers around the Province. The project trains rural workers over multiple weeks on different elements of the law and includes many resources and presenters from the legal aid clinic system. The Community Development Project Worker is funded by the Maytree Foundation to help tenants develop tenant leadership to create opportunities for residents to engage with each other through tenant group leadership activities and partnerships with community agencies across Toronto. The CDPW meets with tenants directly in their buildings and helps them develop capactiy to work on asserting their rights and engaging in the civic process. The project also helps tenant decide on the collective needs of a building and hooks them up with community partners to meet their goals. 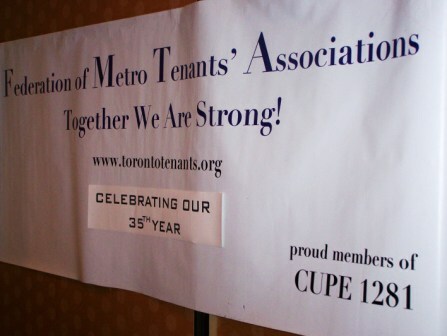 The FMTA has received funding from multiple sources over the years to create, edit, and publish numerous guides, manuals, fact-sheets, sample letters and newsletters aimed at helping tenants better understand their rights. Where possible, we aim to translate these materials into different languages. We currently have materials in 23 different languages.